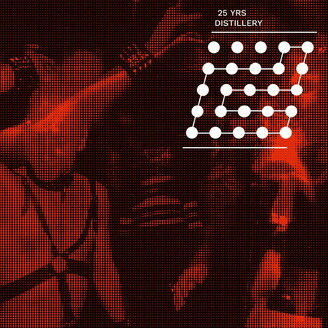 25 years of Distillery. That’s a memory-laden, even historical event for underground and club culture. Or let’s just say, culture in general. Getting into detail about the impact, this club had for the last quarter-century, would fill a couple pages, so let’s just state the obvious real quick: Distillery has witnessed and co-determined socio-cultural change and progress in its past. Be it in its hometown Leipzig, basically building up the city’s infrastructure for club culture over the years. Or be it on national or international scale. It carries a legacy of being one of the longest-serving and one of the most influential clubs in Germany. Period. At the same time, it’s focus always lies ahead, sensing trends, running a booking that intersects the big players with the up and coming of an underground electronic music scene. With the same spirit that supported DJ/producers on their way to international careers, it brings up new talent. It is this spirit in particular that now finally led into the idea of mirroring the club’s philosophy within the agenda of a record label. And as catalogue number one, unfolding a whole new chapter in Tille history, this anniversary compilation right here already nails what Distillery Records will be about. A conjunction of familiar faces and newcomers. A playground for residents, affiliates and just great artists that we like. An inclusive creative endeavour that covers a stylistic variety as broad as the club’s open minded programming. That said, a rundown of the tracklist will prove the point. You’ll find “Thursday Noon”, the opening synth driven House-banger of young blood Napoleon Dynamite next to deep and spaced out Techno courtesy of Tille-resident Chris Manura. Lars Christian Müller’s atmospheric trip “No Future” next to Leipzig-scene-honcho Filburt who hands in a stomping and steaming cut, tinged by Electro-references. You’ll find a joint venture by Daniel Stefanik and Mathias Kaden that progresses from Detroit leanings into an affectionate Piano finale, bass heavy breaks by Monkey Maffia, Acid-grounded Dub Techno by genre-heavy weight Joel Mull, a rather odd take on Techno by Georg Bigalke and the record’s mightiest bounce in form of Héctor Oak’s take-no-prisoners-approach to move a crowd as the conclusion of this compilation. A compilation, by the way, that’s accompanied by three digital only bonus tracks: Matthias Tanzmann’s “Salinas Thing” - a legit peaktime weapon flirting with contemporary tribal sounds, chord driven Deephouse by Thomas Stieler and the irresistibly grooving “Da Silva” by another key figure of the Leipzig-scene: Sven Tasnadi. And a compilation that’s evidently curated with an all-killer-no-filler-agenda and the overall sensible approach to manifest the unique Distillery vibe on two plates of vinyl.